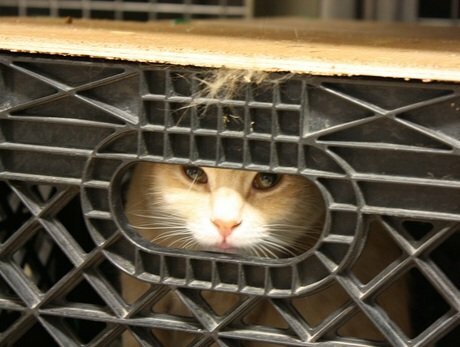 One of Nevada Humane Society’s “milk crate” cats. DogTime and CatTime are thrilled to support Nevada Humane Society, recipient of a DogTime Media donation as chosen by Petties winner Evan Filler. Nevada Humane Society was founded in Reno in 1932 by two local women dedicated to improving the treatment of stray animals in the area. Nevada Humane Society is a no-kill organization that finds homes and provides care for homeless pets while creating a no-kill community. We accomplish our mission through quality animal care, comprehensive adoption programs, accessible low-cost spay/neuter services, and a free Animal Help Desk. About half of the animals come to the NHS shelter through direct owner surrenders from Washoe County residents. The other half are strays that are transferred to NHS from Washoe County Regional Animals Services after the five-day legal hold period. Animals in our care are housed in clean, bright and spacious surroundings, receive needed medical care, and are socialized by volunteers until they are adopted. Animals are also spayed or neutered, vaccinated and microchipped before going to their new families. Twenty cats and kittens were recently found abandoned, secured inside milk crates and left outside a veterinary clinic. They are now at Nevada Humane Society and will soon be available for adoption. “The veterinarian who found these kitties said the milk crates were stacked one atop the other and left outside behind their clinic. The person went to great lengths to secure them in the crates and dropped them off at a time when no one would have seen it happen,” said Denise Stevens, Operations Director for Nevada Humane Society. The cats have been fully examined by Nevada Humane Society’s veterinary team, and will be spayed or neutered, vaccinated and microchipped before they become available for adoption. All the cats are sweet and friendly, with the only immediately apparent medical issue being mild upper respiratory infections (colds). Inspired by the work of Nevada Humane? Consider making a donation to their organization.